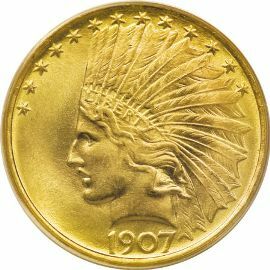 The first type of Indian Head Eagles was coined at the US Mint in 1907 and 1908. 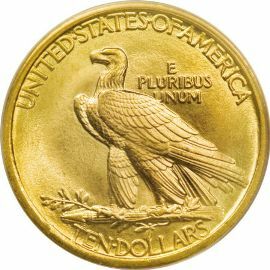 These gold coins can be easily distinguished by the lack of the motto "IN GOD WE TRUST" on the reverse, to the left of the eagle. Having been designed by Augustus Saint-Gaudens, the coins follow the same standards as the previous Liberty Head issue circulated since 1838. In 1907 these coins were originally struck with a wire rim, making them difficult to stack. The wire rim was later changed to a rolled edge to improve the design. portrays a Native American wearing a feathered war bonnet with the word "LIBERTY" inscribed on it. The front of the coin also has thirteen stars around the upper periphery, with the date inscribed below. The reverse of the coin shows an eagle perched on a bundle of arrows, with the motto "E PLURIBUS UNUM" to the right. Encircling the coin above the eagle is the legend "UNITED STATES OF AMERICA". Below is the denomination "TEN DOLLARS".